Burma is undergoing vast changes and the transition from dictatorship to democracy has been welcomed worldwide. As the country opens up it is the perfect opportunity for a generation of travelers who wish to experience rural Burma before it changes too much. We begin our biking tour as soon as you land at Heho airport. We then move sedately through some lovely rural countryside, working fields, pine forests and many of the quaint villages that dot the area, as we head towards the town of Pindaya. We then explore the ethnic villages that grow tea around Kalaw before cycling on to Shwe Inn Dein – home to more than 1,000 pagodas built over the course of 300 years. This atmospheric site is full of mystery and the wonder of faith. A real highlight of Burma and the tour comes next as we arrive at the famous Inle Lake. This is where we find the unique leg-rowing Intha people who live on floating villages dotted about the lake. It is the second largest natural expanse of water in Burma, at 23 kms long and 11 kms wide. After a morning cycle we have a relaxing cruise on the lake and make many stops at floating villages and monasteries, a perfect way to end our exploration of the Shan Hills. We are met at Heho Airport; please aim to arrive by 9 am. After a bike fitting we cycle straight from the airport towards the town of Pindaya. Our route will be on a quiet, undulating road through a mosaic of fields. We'll pass through a few villages and stop for photo and snack breaks on the way. Our destination of Pindaya is home to limestone caves that house thousands of Buddhas. We'll have a visit to the caves before dinner. Today we'll explore the ethnic tribes around Kalaw with a ride to local Palaung villages. We traverse this region of tea plantations on a mixture of tarmac and dirt roads. Stopping at Pein ne Pin where we will likely see local women weaving cotton. We leave Kalaw early today for a full days cycling to Inle lake. We use a quiet country roads which take us through a range of local villages, take a break at Shwe Inn Dein, home to over 1,000 pagodas built during the 14th to 17th centuries, then cycle north to Nyaung Shwe. Today we start by bicycle but we will be boating in the afternoon. We take a scenic ride along the eastern side of Inle Lake to the small farming village of Tale Oo. 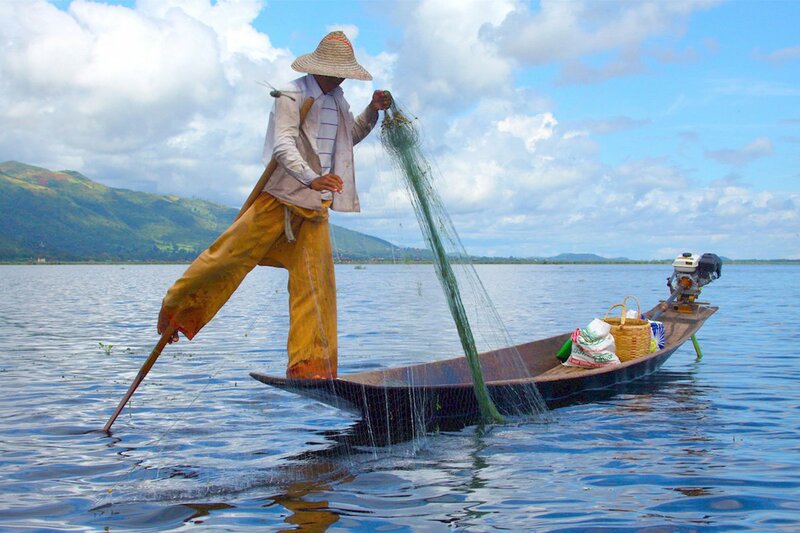 Next we head out onto the waters of Inle Lake to discover some of the floating highlights. We are transferred to Heho Airport for one drop off. If you would like to spend additional nights in Inle we can help to arrange this for you. Amazing way to see a country and keep the kids entertained and active! An awesome trip, breathtaking scenery, good food and an interesting cultural experience. I would highly recommend it. Our guide Tun Tun was a great guide - friendly, helpful, informative, knowledgeable and very easy to get along with. I would most certainly recommend him. A professionally planned trip on quite roads and quieter tracks through stunning countryside and fascinating communities, led by a truly impressive young man who allowed us insights into his world. Thank you. We ride 179 km on country lanes and quiet roads offering up some excellent bicycle touring experiences. We use dirt tracks, some tarmac, and pedal easily on gentle rolling hills. We also use short-cuts through rice fields, see ancient cities and get a full dose of scenic countryside. Passing through many villages en route, you find the level of local curiosity undiminished as well as incredibly friendly and polite. We share the road with ox carts, cyclists, and waving children. There is an unbelievable amount to see throughout the tour and we stop frequently to view temples and great rural scenes especially if riding during the harvesting season. Biking Conditions: This tour covers around 179 kilometres in four cycling days. The roads can vary from being in quite good condition to broken tarmac, to vehicle wide dirt trails. There is no technical riding on this trip, but there is one long day. Today we'll transfer to Kalaw to spend the rest of the day exploring the ethnic tribes around Kalaw with a ride to local Palaung villages. The Palaung people are a Mon ethnic minority group known for the tea they grow and cure to sell, particularly the pickled tea, or lepet. We traverse this region of tea plantations on a mixture of tarmac and dirt roads. Stopping at Pein ne Pin where we will likely see local women weaving cotton longyis in the traditional pattern for the village - deep red with thin blue stripes. We continue our cycle along a narrow dirt road which continues through the tea plantations, on towards another lovely village, Taung Ni. We get to take in the superb views from here before heading down to Aung Ban, a larger regional trading town from where we cycle along the paved roads back to Kalaw and our hotel. We leave Kalaw early today for a full day's cycling, mostly downhill, to the famous Inle lake; undoubtedly one of Burma's greatest treasures. We use a quiet, little used, off road route; it's a bit bumpy in places but takes us through a range of local villages where we can really appreciate the day to day lives of the indigenous people. We take a break at Shwe Inn Dein, home to over 1,000 pagodas built during the 14th to 17th centuries. This incredible collection of weather beaten, gold plated stupas is nestled between the landscape of Inle Lake on one side and forested covered mountains on the other. We cycle along the lake north to Nyaung Shwe where we overnight and enjoy a flavourful dinner of local specialties. Today we start by bicycle but we will be boating in the afternoon. We cycle along the eastern side of Inle Lake to the small farming village of Tale Oo. It's a beautiful ride through sugar cane fields, garlic and onion plantations, and we have another chance to experience Burmese village life close-up. Next we head out onto the waters of Inle Lake to discover some of the floating highlights of this stunning body of water and a firsthand view of how the shoreline villages make use of this great resource. We visit Phaung Daw Oo Pagoda, known for its five Buddha images richly covered in 24-carat gold leaf. We pass the lake's floating gardens, which provide an unusual location for harvesting produce, en route to Innpaw Kone village, known for its traditional silk and lotus fibre weavings. We visit the Nga Phe Kyaung Monastery, also known as the Jumping Cats Monastery; you'll see why when we visit! We return to our hotel for dinner and farewells. We are transferred to Heho Airport for one drop off, please coordinate our departure time with us. If you would like to spend additional nights in Inle we can help to arrange this for you. Included are TREK mountain bikes with lightweight alloy frames, 24- to 27-speed gearing, disc/v-brakes and Shimano components and front suspension.